The American Broadcasting Company (ABC) operates television and radio networks in the United States and is also shown on basic cable in Canada. Created in 1943 from the former National Broadcasting Company (NBC) Blue radio network, ABC is owned by the Walt Disney Company and is part of the Disney-ABC Television Group. It first broadcast on television in 1948. Corporate headquarters are in New York City, while programming offices are in Burbank, California. As of 2006, ABC is among the most successful networks. The formal name of the operation is American Broadcasting Companies, Inc., and that name appears on copyright notices for its in-house network productions and on all official documents of the company, including paychecks and contracts. The network today, in fact, is the last of the "Big Three" broadcasting networks to keep its full name. The Columbia Broadcasting System (CBS) adopted initialism in 1974 and the National Broadcasting Company (NBC) did so in 2004. The network is sometimes referred to as the “Alphabet Network,” due to the letters "ABC" being the first three letters of the English alphabet. As one of the major broadcasting networks, ABC had a tremendous impact on American culture in the twentieth century, bringing quality sports and entertainment programming to the public. After years of study, the Federal Communications Commission (FCC), in 1940, issued a "Report on Chain Broadcasting." Finding that two corporate owners (and the cooperatively owned Mutual Broadcasting System) dominated American broadcasting, this report proposed "divorcement," requiring the sale by RCA of one of its chains. NBC Red was the larger radio network, carrying the leading entertainment and music programs. In addition, many Red affiliates were high-powered, clear-channel stations, heard nationwide. NBC Blue offered most of the company's news and cultural programs, many of them "sustaining," or unsponsored. Among other findings, the FCC claimed RCA used NBC Blue to suppress competition against NBC Red. The FCC issued a ruling that "no license shall be issued to a standard broadcast station affiliated with a network which maintains more than one network." NBC was forced to sell one of its networks, choosing to sell NBC Blue. RCA found a buyer in Edward Noble, owner of Life Savers candy and the Rexall drugstore chain. The sale closed on October 12, 1943. The new network, known simply as "The Blue Network," was owned by the American Broadcasting System, a company Noble formed for the deal. In mid-1944, Noble renamed his network American Broadcasting Company. This set off a flurry of re-naming; to avoid confusion, CBS changed the call letters of its New York flagship, WABC-AM 880, to WCBS-AM in 1946. In 1953, WJZ in New York took on the abandoned call-letters WABC. Faced with huge expenses in building a radio network, ABC was in no position to take on the additional costs demanded by a television network. To secure a place at the table, though, in 1947, ABC submitted requests for licenses in the five cities where it owned radio stations. On April 19, 1948, the ABC television network went on the air. For the next several years, ABC was a television network mostly in name. Except for the largest markets, most cities had only one or two stations. The FCC froze applications for new stations in 1948, while it sorted out the thousands of applicants, and rethought the technical and allocation standards set down in 1938. Noble finally found an investor in United Paramount Theaters (UPT). Divorced from Paramount Pictures at the end of 1949 by Supreme Court order, UPT had plenty of money on hand and was not afraid to spend it. UPT head Leonard Goldenson immediately set out to find investment opportunities. Shortly after the ABC-UPT merger, Goldenson approached DuMont with a merger offer. Goldenson and DuMont's managing director, Ted Bergmann, quickly agreed to a deal. However, Paramount vetoed the sale. By 1956, the DuMont network had shut down. After its acquisition by UPT, ABC at last had the means to offer a full-time television network service. By mid-1953, Goldenson had begun a two-front campaign, calling on his connections at the Hollywood studios (he had been head of the Paramount theater chain since 1938) to convince them to move into programming. He also convinced long-time NBC and CBS affiliates in several markets to move to ABC. His two-part campaign paid off when the "new" ABC hit the air on October 27, 1954. Among the shows that brought in record audiences was Disneyland, produced by and starring Walt Disney. MGM, Warner Bros., and Twentieth Century-Fox were also present that first season. Within two years, Warner Bros. was producing ten hours of programming for ABC each week, mostly interchangeable detective and western series. The mid-1950s saw ABC finally have shows in the top-10, including Disneyland. However, it still had a long way to go. It was relegated to secondary status in many markets until the late 1960s, and in some cases well into the 1980s. While ABC-TV continued to languish in third place nationally, it often topped local ratings in the larger markets. With the arrival of Hollywood's slickly produced series, ABC began to catch on with younger urban viewers. As the network gained in the ratings, it became an attractive property, and over the next few years ABC approached, or was approached, by General Electric (GE) (which would have had to sell its stake in RCA, owner of NBC), Howard Hughes, Litton Industries, General Telephone and Electronics (GTE), and International Telephone & Telegraph (ITT). ABC and ITT agreed to a merger in late 1965, but after numerous delays, the deal was called off on January 1, 1968. By the early 1960s, ABC Radio found its audience continuing to gravitate to television. With a decline in network listenership and far less network programming, ABC's owned local stations (like WABC and WLS) became successful playing popular music. By the mid-1960s, however, hourly newscasts, commentaries, and a few long-running serials were all that remained on the network schedule. Lawrence Welk's musical hour (simulcast from television), and Don McNeill's daily Breakfast Club variety show were among the offerings. On January 1, 1968, ABC's radio programming service split into four new "networks," each one with format-specific news and features for pop music-, news-, or talk-oriented stations. The "American" Contemporary, Entertainment, Information, and FM networks were later joined by two others—Direction and Rock. During this period of the 1960s, ABC founded an in-house production unit, ABC Films, to create new material especially for the network. Shortly after the death of producer David O. Selznick, ABC acquired the rights to a considerable amount of the Selznick theatrical film library. In the late 1970s, Leonard Goldenson led the network into the "made-for-TV" movies era. The Thorn Birds, The Winds of War, and miniseries such as Alex Haley's Roots set record ratings. ABC Sports reached a high point during the 1960s as well. ABC launched the successful Wide World of Sports, with host Jim McKay, which helped boost the networks viewership. Also notable during the 1960s was ABC's development of instant replay technology during live broadcasts, which had never been used before. ABC's dominance carried into the early 1980s. By 1985, however, veteran shows like The Love Boat had lost their attraction and a resurgent NBC was leading in the ratings. ABC shifted its focus to situation comedies. During this period, ABC seemed to have lost the momentum that once propelled it; there was little offered that was innovative or compelling. Like his counterpart at CBS, William S. Paley, founding father Leonard Goldenson had withdrawn to the sidelines. ABC's ratings and the earnings thus generated reflected this loss of drive. Under the circumstances, ABC was a ripe takeover target. However, no one expected the buyer to be a media company only a tenth the size of ABC, Capital Cities Communications. The corporate name was changed to Capital Cities/ABC. As the 1990s began, one could conclude the company was more conservative than at other times in its history. The miniseries faded off. Saturday morning cartoons were phased out. But the network did acquire Orion Pictures' television division in the wake of the studio's bankruptcy, later merging it with its in-house division ABC Circle Films to create ABC Productions. Shows produced during this era included My So-Called Life, The Commish, and American Detective (the latter co-produced with Orion before the studio's bankruptcy). In an attempt to win viewers on Friday night, the TGIF programming block was created. The lead programs of this time included America's Funniest Home Videos, Full House, Family Matters, Home Improvement, and Step by Step. This programming was hardly controversial: Good parenting, abstinence, and maintaining a nuclear family were common themes. ABC's relationship with Disney dates back to 1953, when Leonard Goldenson pledged enough money so that the Disneyland theme park could be completed. ABC continued to hold Disney notes and stock until 1960, and also had first call on the Disneyland television series in 1954. With this new relationship came an attempt at cross-promotion, with attractions based on ABC shows at Disney parks and an annual soap festival at Walt Disney World. Despite intense micro-managing on the part of Disney management, the flagship television network was slow to turn around. In 1999, the network was able to experience a brief resurgence with the hit game show Who Wants to Be a Millionaire. However, it became overexposed, appearing on the network sometimes five or six nights during a week. ABC's ratings fell dramatically as competitors introduced their own game shows and the public grew tired of the format. Alex Wallau took over as president in 2000, and helped ABC find its niche in dramas such as Alias, Desperate Housewives, Boston Legal, and Lost. However, their reality television programming has not been as successful. Yet ABC, along with the other "Big 3" plus FOX, continues to be among the most watched television networks in America. Borrowing a proven Disney formula, there have been attempts to broaden the ABC brand name. In 2004, ABC launched a news channel called ABC News Now. Its aim is to provide round-the-clock news on over-the-air digital TV, cable TV, the Internet, and mobile phones. The Walt Disney Company's largest stockholder is Steve Jobs, founder and CEO of Apple, Inc., who as well is a member of its board, and thereby exercises a strong influence in the direction of ABC's parent company. A 2003 Nielsen estimate found that ABC could be seen in 96.75 percent of all homes in the United States, reaching 103,179,600 households. ABC has 10 VHF and UHF owned-and-operated television stations and 218 affiliated stations in the U.S. and U.S. possessions. ABC splits "live" production between East and West Coast facilities: ABC Television Center West in Hollywood, California (once the Vitagraph film studios) accommodates sets for the daily soap operas; and the ABC Television Center East, once clustered around a former stable on West 66th Street, New York City, and now split between several soundstages in the same New York neighborhood. Some ABC news programs such as Good Morning America are broadcast from ABC's studios in Times Square. ABC's West Coast corporate offices are located in Burbank, California adjacent to the Walt Disney Studios and the Walt Disney Company corporate headquarters. Before its early color transmissions, the ABC identity was a lowercase ABC inside a lower case A. That logo was known as the "ABC Circle A." 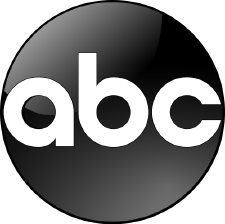 The logo was modified in the fall of 1962 when ABC started using the current "ABC Circle" logo (designed by Paul Rand) with ultra-modern (for its time) lower case ABC inside. The typeface used is a simple geometric design inspired by the Bauhaus school of the 1920s; its simplicity makes it easy to duplicate, something ABC has taken advantage of many times over the years (especially before the advent of computer graphics). Through the 1980s and 1990s, as radio's music audience continued to drift to FM, many of ABC's heritage AM stations—the powerhouse properties upon which the company was founded, like WABC New York and WLS Chicago—switched from music to talk, syndicating several conservative talk show hosts. In addition to its most popular offerings, ABC News Radio and Paul Harvey News and Comment, ABC also provides music programming to automated stations, along with weekly countdown and daily urban and Hispanic morning shows. While many of ABC's radio stations and network programs remain strong revenue producers, growth in the radio industry began to slow dramatically after the dot-com boom of the late 1990s and the consolidation that followed the Telecommunications Act of 1996. In 2005, Disney CEO Bob Iger sought to sell the ABC Radio division, having declared it a "non-core asset." With the sale of ABC Radio, ABC became the second heritage American television network to sell its original radio properties. NBC dismantled its radio division in the late 1980s. CBS is now the only broadcast television network with its original radio link, though both FOX News and CNN have a significant radio presence. Today, ABC owns nearly all its in-house television and theatrical productions made from the 1970s forward, with the exception of certain co-productions with producers. Also part of the library is the Selznick library, the Cinerama Releasing/Palomar theatrical library, and the Selmur Productions catalog the network acquired some years back, and the in-house productions it continues to produce, although Buena Vista handles international distribution. ABC.com was the first network website to offer full length episodes online from May–June 2006. Beginning with the 2006–2007 television season, ABC.com began regularly airing full length episodes of some of its popular shows on its website the day after they aired on ABC, with some advertisements (though less than when broadcast for television). This is assumed to be a response to the popularity of digital recording devices and piracy issues that major network broadcasters are facing. Launched September 27, 2004, ABC1 is a British digital channel available on Freeview (digital terrestrial), Sky (satellite), and Virgin Media (cable) service owned and operated by ABC Inc. Its current schedule is a selection of past and present American shows, nearly all produced by Touchstone Television, and is offered 24 hours a day on the digital satellite and digital cable platforms, and from 6 a.m. to 6 p.m. on the digital terrestrial platform, Freeview. Since ABC1's launch, it had aired the long-running ABC soap opera General Hospital, making it the only U.S. daytime soap to air new episodes in the U.K.; however, in late 2005, it was pulled off the air due to low ratings, leaving British television without any U.S. daytime soaps. ↑ Yale Law Journal, The Impact of the FCC's Chain Broadcasting Rules. Retrieved March 18, 2007. ↑ The Museum of Broadcast Communications, Flashback: The 50th Anniversary of ABC. Retrieved March 18, 2007. ↑ Hear the Issues, Television Networks—ABC. Retrieved March 18, 2007. ↑ Teletronic, Warner Brothers Presents. Retrieved March 18, 2007. ↑ Disney Legends, Leonard H. Goldenson (Television) Inducted 2004. Retrieved April 12, 2007. ↑ Encyclopedia Britannica, American Broadcasting Company. Retrieved March 18, 2007. ↑ THe Canadian Encyclopedia, Disney Buys ABC in Merger Mania. Retrieved March 18, 2007. ↑ Broadcast Engineering, ABC News to re-launch ABC News Now. Retrieved March 18, 2007. ↑ BBC, Disney plans Freeview TV channel. Retrieved March 18, 2007. Barnouw, Erik. The Golden Web: A History of Broadcasting in the United States, 1933–1953. New York: Oxford University Press, 1968. Kisseloff, Jeff. The Box: An Oral History of Television, 1920–1961. New York: Viking Press, 1988. Sobel, Robert. ITT. New York: Truman Talley, Times Books, 1982. Taylor, Alan. We, the Media: Pedagogic Intrusions into U.S. Mainstream Film and Television News Broadcasting Rhetorics. Peter Lang Publishing, 2005. ISBN 3631518528. History of "American Broadcasting Company"